If you are considering building a green home, you are not alone. Over the past few decades the construction industry has reported a surge in the demand for sustainable housing, which adds up to 30% of their projects in the US housing market*. Vinyl: Vinyl frames are made primarily from PVC (polyvinyl chloride). What does that mean to you? It means that your vinyl window frame is virtually maintenance free. Because not all vinyl formulas are the same it’s important to choose a quality vinyl window, focused on high performance when it comes to insulation and durability. Fiberglass: Fiberglass frames are produced using glass fibers and resin which makes them very strong. This type of window frame expands and contracts at approximately the same rate as the insulated glass it surrounds, which aids in energy efficiency. Plus, these frames are durable resisting rotting, swelling or warping. These are very low maintenance frames that don’t require painting over time, unless you want to change the color. Aluminum: Aluminum creates a timeless look and provides a sleek and stylish profile. 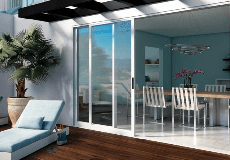 The frames are durable and low maintenance in most climates, although not recommended for corrosive environments, such as beach locations. Thermally Improved Aluminum is a must, because they are designed with a thermal barrier between the panes of glass. This reduces heat and cold conductivity that can occur with standard aluminum. Wood: Milgard offers a hybrid frame option when it comes to wood windows. Enjoy the warm, aesthetic look of a solid wood interior frame with the durability and strength of a fiberglass exterior. This frame style provides excellent insulating properties, lasting beauty and exceptional performance. Plus, you can stain the wood interior to match the wood finishes in your home. No matter what window material you select for your frames, Milgard windows and patio doors are ENERGY STAR® certified which can lower your household energy consumption and reducing your home's carbon footprint. Plus, high quality, performance windows and patio doors can improve the overall comfort in your home by regulating your indoor temperature no matter what the weather is outside.